Robo-advisors are on the rise, but how do humans feel about receiving financial advice from a computer? They think it’s faster and cheaper, and they trust machines to be “more impartial and analytical than humans”. 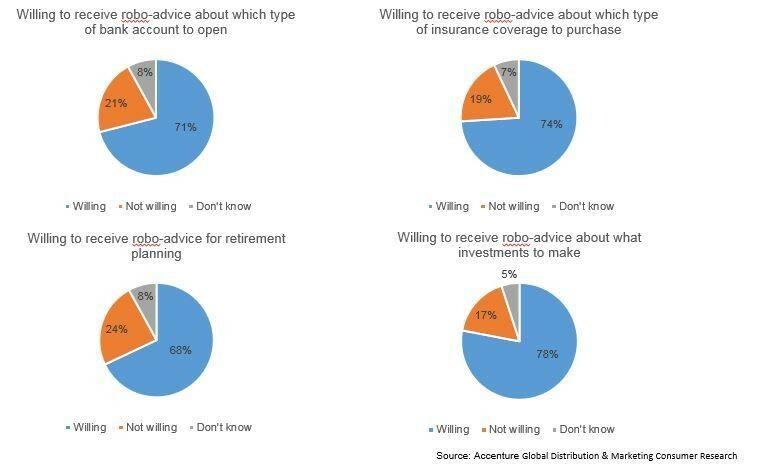 The global study of nearly 33,000 financial services customers found that consumers would be happy to use robo-advice to help them decide which bank account to open (71%), which insurance policy to buy (74%) and how to plan for retirement (68%). Robo-advice first emerged in wealth management, and nearly four out of five respondents (78%) say they would welcome robo-advice on this area of finance. In the wake of the global financial crisis, regulators stepped up efforts to protect smaller investors, but this meant that costs went up for individualized advice. 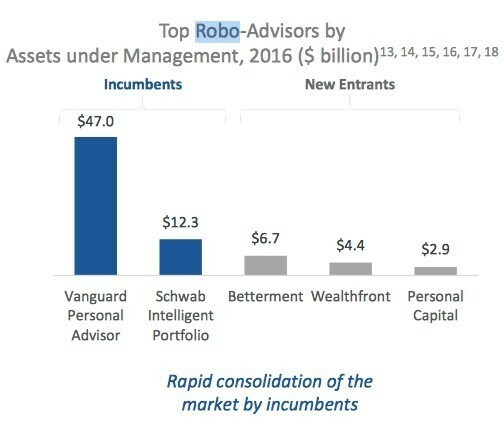 For investment firms, robo-advisors were the obvious solution because they can deliver services at a fraction of the cost of a human financial advisor. In addition, many consumers, particularly young people, want to manage their investments themselves online. But they want to do it quickly and easily, and robo-advice can do the heavy lifting for them. The take-up of automated investment advice is forecast to increase significantly in the next few years. BI Intelligence forecasts that robo-advisors will look after around 10% of all worldwide assets under management by 2020. The technology was pioneered by automated investment start-ups, for example Betterment and Wealthfront, which had assets under management of $6.7 billion and $4.4 billion, respectively, at the end of 2016. However, established investment management firms have also entered the market successfully. Vanguard’s Advisor platform, for instance, had $47 billion in assets under management at the end of 2016. 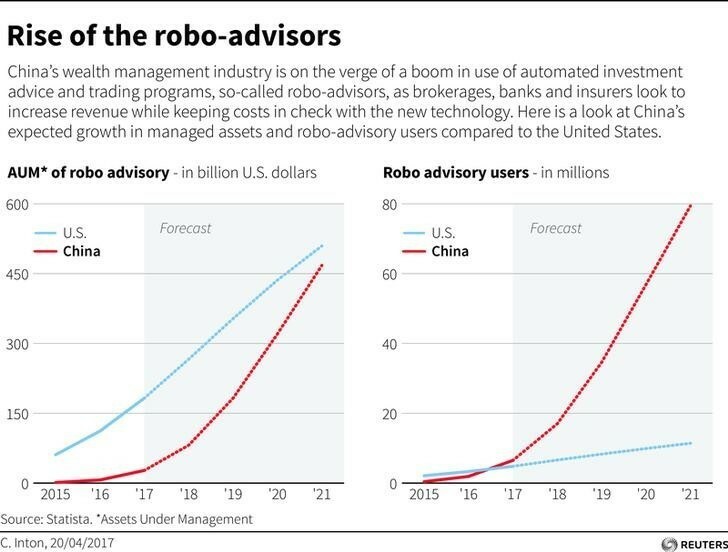 The US has been the home of robo-advice so far, although China is catching up fast. However, firms have to juggle providing cheaper robo-advice with giving customers access to a real person. According to the Accenture survey, many consumers still want to be able to speak to a person for more sophisticated financial products. Nearly two-thirds want human interaction in financial services, especially to deal with complaints (68%) and advice about complex products such as mortgages (61%). Accenture’s 2017 Global Distribution and Marketing Consumer Study covers 18 countries and regions. It found that people with the biggest appetite for robo-advice are in the emerging economies of Indonesia (92%), Thailand (90%), Brazil (86%) and Chile (84%) – all markets where it is already common to use a smartphone or other digital device as the primary vehicle for financial services interactions. Even in the countries with the lowest demand – Canada (56%), Germany (59%) and Australia (61%) – more than half of consumers surveyed said they are willing to use robo-advice. Consumers need to beware, however, as some robo-advisors may not be so impartial after all.